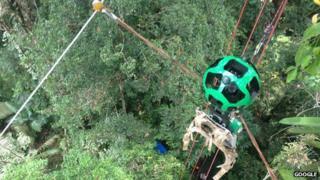 Google has flown one of its Street View cameras down a zip wire for the first time. It set up a wire in the Amazon rainforest to capture new 360-degree images of the trees from root to tip. The round Trekker camera, which weighs 40lb (18kg), has 15 lenses and takes photos every 2.5 seconds. It is usually worn by a walker with a backpack. It reached speeds of 100 km/h (62 mph) on the zip wire from the treetops to the jungle floor, the firm said. The new images have been released on Google Maps. Google began photographing the Amazon in 2010, when it put 12 Trekkers on boats and sailed them up two of the river's main tributaries, the Rio Aripuana and Rio Madeira. The photography project is a collaboration with the Amazonas Sustainable Foundation (FAS). "Most people won't go to a rainforest in their lifetimes," said Google spokesperson Laurian Clemence. "We also hope environmentalists will use it as a tool to go and see what's there." In 2009 UK Dr Julian Bayliss discovered a hidden forest in the mountains of northern Mozambique using Google Maps. When he and a research team visited it, they found lots of previously unrecorded wildlife. "Whatever we see we pick up, and there's a high probability that it's going to be a new species," he told the BBC at the time.